Download AndroDumpper APK for Android Smartphones and Tablets for free. AndroDumper Free Download, Although Patching or Modifying Wi-Fi Passwords is strongly prohibited an all countries, therefore we recommend you to use AndroDumpper App Download as a testing tool, to prevent yourself from any legal punishments. Also, you can use the amazing application to check the vulnerabilities of your Wi-Fi system for better security of your device. AndroDumpper App, download link has given, click on the download bar for the latest version. AndroDumpper APK, available for both Rooted and No Rooted devices but there are slight differences. Let Me Explain them to you. AndroDumpper for Rooted Device: AndroDumpper App will Run Successfully on your Device without any compatibility issue with your Android Version and When Connected it will show Password of Connected Device. AndroDumpper for Not Rooted Device: AndroDumpper Tool is available for no Root users as well but you will need Android Smart Phone or Tablet with Android 5.0 and up. Otherwise, this app won’t work on your Device. AndroDumpper Android will scan Any Possible vulnerability on your Device. If found it will connect to your network without a password. AndroDumpper Supports Leading Router Brands i.e. Huawei Routers, D-Link Routers, Tp-Link Routers, Vodafone Routers and Asus Routers with other new routers. AndroDumpper worked in Both Root and No-Rooted Users. AndroDumpper APK is Free to Download and Use. Checks your Wi-Fi Security Router, if found any it will fix it. More new Routers Supported. Include Huawei Routers, D-Link Routers, Vodafone Routers, and Asus Routers. More algorithms to penetrate more secure routers. Before installation pleases enable Unknown Resources on your Android Device. Follow these steps to enable unknown resources from your Phones> Settings> Security> Un-Known Resources> Check Enable. 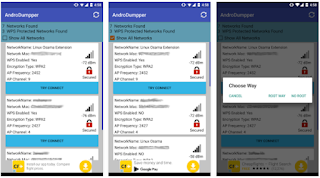 AndroDumpper Android is best free wi-fi bypassing tool that you can use to connect to any secured wi-fi network without knowing the password.